Landowners who volunteer are often not those who most need to improve their operations. Conservation practices favored by landowners are often not the most effective. The political imperative for every landowner and every county to take a shot at the money defeats the effort to target resources where they are most needed. This study reveals the biggest flaw in the voluntary-only approach: Landowners who voluntarily start conservation practices can also stop any time. As a result, the voluntary-only approach is not achieving the lasting improvement in farm practices needed to clean up Iowa and the nation’s waterways. 1. Heal or prevent temporary gullies that are direct pipelines delivering polluted runoff to waterways. 2. 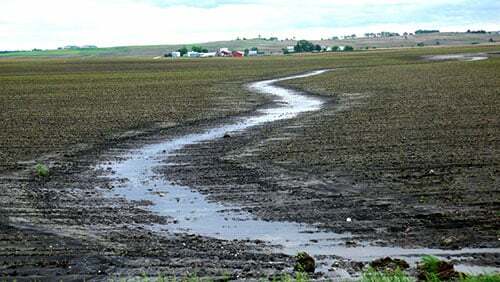 Keep at least 50 feet of permanent vegetation between cropland and waterways to filter runoff from farm fields (Photo courtesy of the Des Moines Register). Photo Courtesy of the Des Moines Register) Copyright Des Moines Register. Photo by Christopher Gannon. Register Photos. Used with Permission. 3. 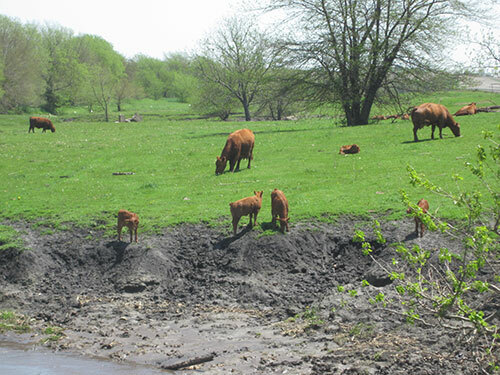 Control the access of livestock to waterways to minimize damage to streams. 4. End the application of manure to frozen, snow-covered or saturated ground. We could and should argue about if this is the right list of standards. Standards should be tailored to different landscapes and watersheds. But there must be standards and they must not be optional. Not all landowners would be affected by the standards. In most cases only one or two of the standards would apply to an individual farm. In five Iowa counties, for example, we found that meeting a 50-foot riparian buffer standard would affect only 13 percent of the landowners in those counties. Seventy-one percent of the affected landowners could meet the standard by planting an acre or less of cropland in grass. County soil and water conservation districts should be responsible for providing landowners with the technical help they need to meet the standards. Technical and financial help should be available to landowners who want to exceed the standards and especially to those working together to heal their local watershed. Taxpayers should provide financial help to those landowners who can show that meeting one of more of the standards will impose a serious financial hardship. Meeting just these standards will not get us all the way to clean water. But throwing more money at the same old, failed voluntary approach promoted by agricultural interests will get us nowhere. The basic standards of care are a foundation to build more effective voluntary programs that work better for farmers, taxpayers and our waterways. Combining common-sense standards and investing tax dollars to get additional practices on the ground in the right places is the path to clean water.